The tech behind a device that might be able to reawaken connections between the brain and the body. On December 5, 2011, Andrew Meas wiggled his toes for the first time since a motorcycle accident four years earlier paralyzed him from the chest down. Within a week, he was beginning to stand. Meas’s remarkable (albeit partial) recovery comes courtesy of a groundbreaking use of an electrode array implanted over his spinal cord. A) When a person with a spinal cord injury thinks about wiggling his toes, the message travels from the brain down the spinal cord, but fails to reach its destination. B) An array of 16 electrodes implanted over the lower spinal cord stimulates circuitry that controls the lower body, awakening dormant neurons that carry the message. 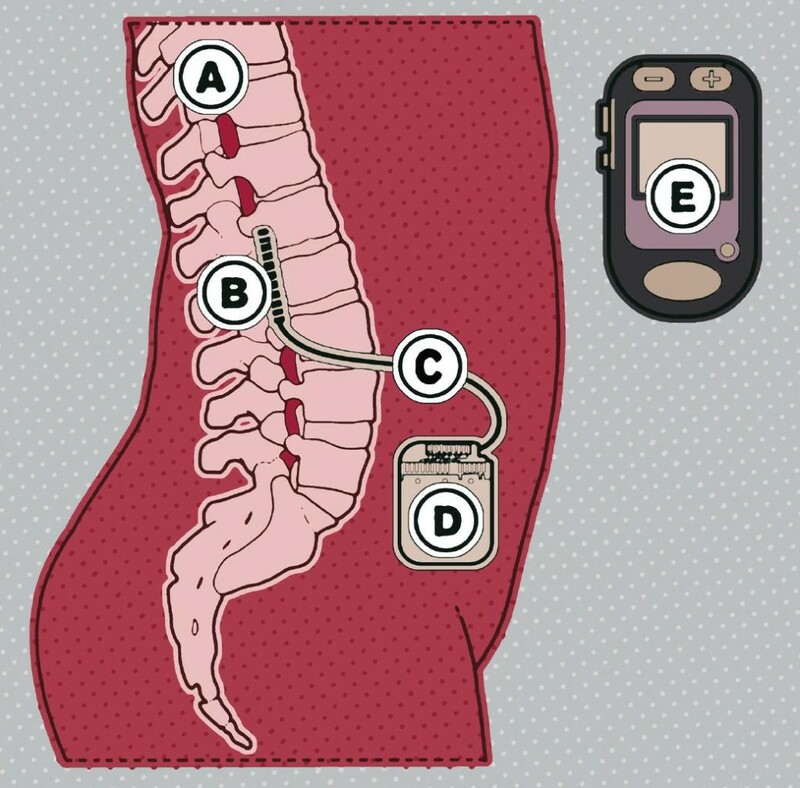 C) A wire connects the electrode array to the stimulator, a rechargeable device about the size of a pager, implanted in the abdomen just below the skin. D) The stimulator contains programs that excite various neural circuits. Different frequencies, voltages, and combinations of electrodes enable different movements. E) A handheld remote allows the user to select which circuits he wants to stimulate—for example, left toes or right leg. This article originally appeared in the July 2014 issue of Popular Science.